So with the conclusion of the film project, what have we learned? I think I've picked up more engine and technical skills in the last two weeks that I have in the entire first year. It was intense, thrilling and enlightening. I feel more confident after this project about my future on the course than I have done for a long time, and that optimism will hopefully be long lived- I just feel excited for the next time I'll get to sculpt in z-brush or make emissive lightning in Unreal 4. What went well overall was our ability to work as a team. We were like-minded, ambitious and organised, using lists and graphics to keep scheduled- which wasn't much of a problem anyway since everybody was in labs everyday, often working from 10am to 9pm. This is also made communication fluid and constant, there as a constant stream of feedback and help where it was needed and noone was reserved about teaching processes or technical skills. It was a great environment and I'm terribly thankful to my team for such an atmosphere. In terms on the scene itself I think the technical aspects were particularly strong. We were the only group to have an interactive element (the flickering, glowing sign) and that made it really stand out. We also had lots of texturing detail using things that are generally unstanderadized within our year group yet, like projecting mapping and z-brush that made our scene look polished and accurate. I also think our worked well because of the huge amount of instanced and repeated assets, which meant we could make out scene bigger and more complicated than others, without crippling our tri budget. I also feel our scene choice was quite strong, we were ambitious with it and I know some people regret not choosing a simpler scene and doing it to a higher quality. But on a personal level I'm happy we chose this difficult one because it had so many unique opportunities to make the most of metallic textures and a little bit of sci-fi architecture that makes it so interesting. Aside from our great engine crash from a prior post, the biggest problem we ran into was t he perspective and shape of the room. 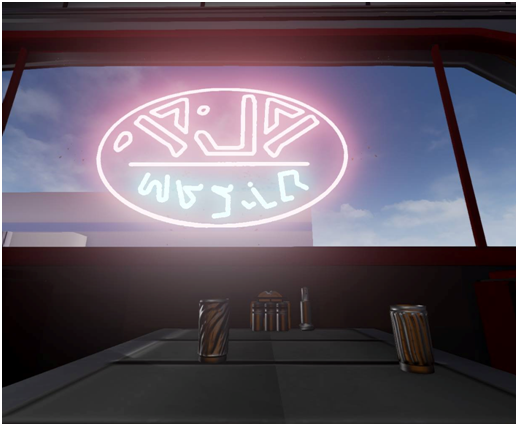 Dex's Diner is a rounded scene so establishing that was allot harder than we had anticipated. The bar in particular was a nightmare to fit, because it was so critical in the shot, it's position was paramount but because of the grooved shape, any mistake was glaring so it had to be constantly re-sized and shaped to fit the room. Lighting was also a challenge since we were dealing with such a huge amount of light sources and try to replicate not only the mood but individual shadows. However one always had an effect on the other making it awkward to balance. There was also so many different light sources to deal with- natural light from the windows, artificial lights and the other numerous different lights in the room and so on. If we had the opportunity to start over, one largely agreed upon notion was that we should be more careful distributing jobs; Tom, who organized our engine (because he happened to organize the main room so assets were naturally sent to him) was inadvertently given him the biggest job. To avoid this in future I would perhaps have a dedicated engine person who handles less assets and texturing because of the extra responsibly they take on. We also could have had 'official' asset reviews. As I mention earlier we were constantly reviewing and feed-backing each other's work as we went along all the process- but an official review might be a good idea to really critic each individual asset as a group all at once, so multiple changes could be made simultaneously instead of a steady trickle of suggestions. Overall though I'm proud of the scene we made. Working as a group was an incredible source of knowledge and the I think we all emerged better game artists because of it. Also on another personal note- this project has gotten me into great working habits- similarly to the last group project. My pace and workflow has improved, and the quantity and quality of my work has grown because of it.